It was a majestic sunrise on the Northumberland Strait as the Dalhousie Tigers boarded Bay Ferries Limited for a seventy-five minute rolling ride from Caribou to Wood Islands. The players had the treat of being able to have a cafeteria meal, roam the decks of the ferry and not be confined to a bus for four hours. But the game day result was not as sunny as the black and gold dropped an uninspiring, 24-1 loss to the Holland College Hurricanes on the last day of the regular season. The specialty teams have been the most consistent of the teams three units during the course of the season. This weekend’s offence produced an abysmal 112 total yards compared to last week’s 496 yards against the Red Bombers who defeated the Seawolves on Saturday to finish first in the AFL. Adam Shambermiradam for the two point convert. His first FG in the second Q made the score 11-1 at the half. Davis connected on two other 3 pointers and his late fourth Q Td on a one yard ball extension and convert rounded out the Holland scoring. Zack Leger nursing an injury did not play running back but did punt the Tiger’s only point. 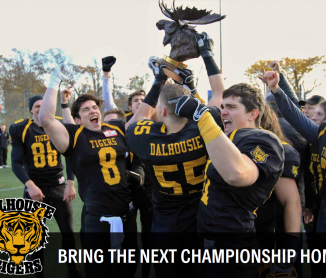 The Dalhousie D played an inspired game against a team who nearly doubled their points in their first meeting with the Tigers. Dalhousie’s lack of O kept their D on the field for long periods of time. A huge sack by Eric Purcell (3T, 5A, 2S) on a third down and William Keneford’s pick thwarted Holland’s deep drives. Josh Bordage (8T, 4A) was everywhere while Liam Manson (5T, 3A) Tyson Young (5T, 3A) and Malcolm Fenech were stalwarts. Rookie QB, Chris Duplisea, who has shown good potential in previous games, had one that he would like to forget. Five dropped passes and the absence of last year’s AFL offensive player of the year, certainly hurt Dalhousie’s outing. Coach Haggett still feels the overall team chemistry is good and getting better. And, that they are capable off repeating as AFL champs. Again, for the third straight game, the Tigers had a dozen or more penalties. Two penalties caused extended drives resulting in a FG and the game’s late fourth Q major. A shout out to the Hurricane organization who makes an event of any home game. On a cold and windy Saturday with a pep band playing, good eats and an enthusiastic crowd, Holland College was victorious. The Dal black and gold hope to have their first complete game of the season this Saturday back on the island in one of the AFL semi-finals. Then, they hope to have a spirited victory ride over the Confederation Bridge and onto the AFL final. Bring your Tiger pride and see you there! GO TIGERS! !